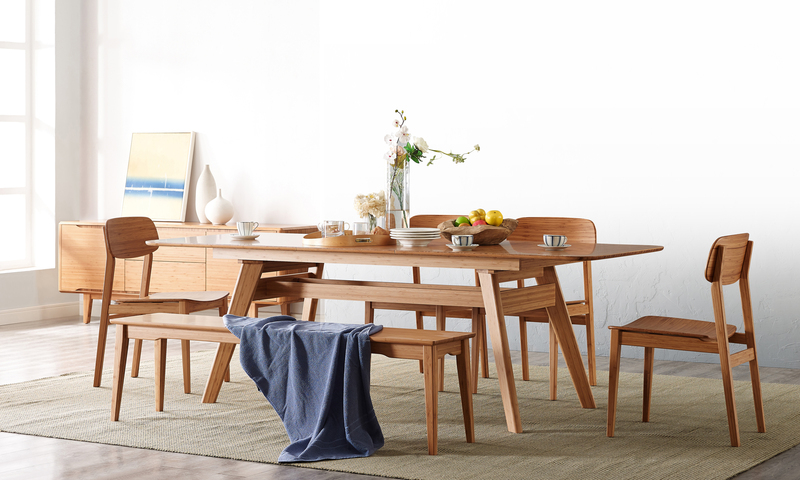 Expertly crafted in earth friendly solid bamboo, Greenington's Currant dining collection features elegant lines reminiscent of Mid-Century Modern. Greenington combines beautiful design, rich colors, and a winning green sustainability story. Greenington Fine Bamboo Furniture has been leading the green revolution long before it became fashionable. Our story began over twenty years ago, when Greenington's founder, Yang Lin, had a vision of creating the finest home products out of the world's most sustainable resource, bamboo. As consumers worldwide became more aware of the beauty, durability, and value of bamboo as a viable building material, his concept for other home furnishings made of bamboo became a reality in 2004 with the creation of Greenington Fine Bamboo Furniture. With his experience in working with the planet's most eco-friendly, rapidly renewable resource, what began as a small factory has grown into a million square foot manufacturing facility, utilizing the latest technologies. Coupled with proprietary processes and techniques, Greenington's fine bamboo furniture has quickly risen to the top of the industry, known for its enduring beauty, style and quality. Today Greenington distributes furniture for both retailers and contract projects all over the world. When you choose Greenington, you get 20 plus years of skilled professional manufacturing talent utilizing an earth friendly, sustainable building material along with a talented and highly creative in-house design team, focused on doing whatever it takes to make your project a winning success. Empowered with the slogan 'Go with Bamboo, Live with Sustainability', Greenington delivers a successful combination of providing high quality furniture with a small carbon footprint. As new technologies continue to emerge, Greenington will continue to stay on the cutting edge to maintain its role as an industry leader by providing its customers with innovative designs made of the finest materials. We are committed to building strong relationships with those equally concerned with sustaining a healthy planet and maintaining a clean environment in which we all can live.